General Release Notes from the November 16th 2015 update. NOTE: If you are experiencing issues with TRAKnet logging you out in a 1-minute time frame, please be sure to follow the below steps to resolve: 1. Go to Tools > Options > Security > Set Session Timeout. 2. Set the timeout to a time that works best for you. 3. Restart TRAKnet. You must restart TRAKnet for this to take effect. Implemented new formulary checking with prescriptions. When writing a prescriptions, medications you are searching for will display relevant formulary information. 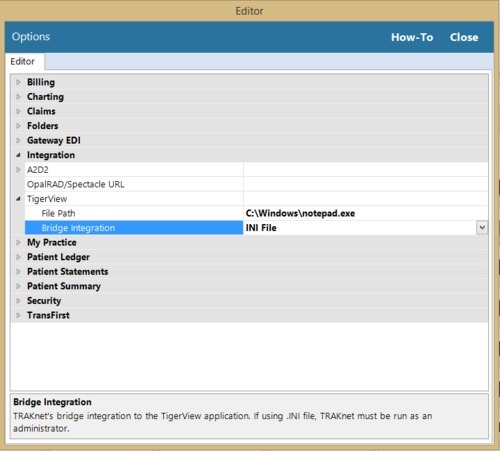 Implemented an option to choose the method of TigerView integration. This is under Tools > Options > Integration > TigerView. If you experience issues using the standard integration method, switching to another and setting TRAKnet to run as an administrator can potentially resolve issues. Implemented an auto-time out feature which will close TRAKnet after a set amount of time has passed. This is located under Tools > Options > Security, is done in minutes and defaults to 5 minutes. Implemented the ability to add, modify and delete Zip Code records. This is under Properties > Zip Codes. Implemented the ability to add, modify and delete Laboratory or Radiology vendors. This is under Properties > Vendors. Implemented the ability to modify and delete LOINC codes. This is under Properties > LOINC Codes. Improvements have been made to the scanner tool in TRAKnet 3.0. The behind-the-scenes component of v2.0 has been implemented in an effort to resolve scanning compatibility issues and make scanning quicker. Resolved an issue wherein staying on the prescription screen for too long would cause the patient’s information to be removed from the finished prescription. Resolved an issue wherein the information in Box 33a on the CMS1500 form was not always populating properly. Resolved an issue wherein credit card payments which had been voided on TransFirst’s website could not be deleted in TRAKnet. Resolved an issue wherein “Unapplied” was displaying in certain columns on the Activity Details report. These columns have been eliminated for clarity. Resolved an issue wherein the Referral Letters report under Reports > Queries was only showing v2.0 referral letters. There are now two reports: v2 and v3. Resolved an issue wherein a patient’s Medications/Allergies screen would display blank if critical information was missing behind the scenes. Resolved an issue wherein the E-Prescribing tab was showing the same patient name in the Paper Prescription history screen. Resolved an issue wherein the Batch Print Superbill tool was taking an exceptionally long time to load. Resolved an issue wherein the “Encounter is being edited by another user” message was displaying even if the encounter was not open by another user. Resolved an issue wherein drug-allergy alerts were not always working as intended. To ensure this is working properly, a new Drug Class tab has been added to Allergies, allowing the user to indicate an allergy to a certain drug class. Resolved an issue wherein the Appointments with Balances query was showing cancelled appointments. Resolved an issue wherein the Print Encounters Batch > Export Superbill to XML feature was not working. Resolved an issue wherein the scheduler printout was only printing one line of any comments. Comment text will now wrap around. Resolved an issue wherein PQRS measures requiring a certain diagnoses were not reading ICD-10 codes. Resolved an issue wherein the Select All Problems button on the Diagnoses tab of the encounter was not properly bringing over ICD-10 codes and descriptions. Resolved an issue wherein a footer was not printing on encounters from the Encounters(2.0) tab. Resolved an issue wherein the One-Click Select button was grayed out when adding a code to a SmartSheet. Resolved an issue wherein clicking in the very bottom left-hand corner of the Save button on the Invoice > Charges (Edit Mode) view was not actually saving the line. Resolved an issue wherein the auto-update feature was causing complications for users working off a terminal service. For assistance with this issue please reach out to our support staff. Resolved an issue wherein it was possible in certain situations to save an insurance payment without first selecting an insurance company. Resolved an issue wherein the title of the Referring Provider screen contained an extra word. Resolved an issue wherein the Time Clock Management screen was not automatically sorting by Clock In time. Resolved an issue wherein Legacy Reports with a location filter were displaying deleted locations. Resolved an issue wherein the Treatment Modify window was not wide enough to display a meaningful amount of a diagnoses description. This has been widened to accommodate longer ICD-10 code descriptions.